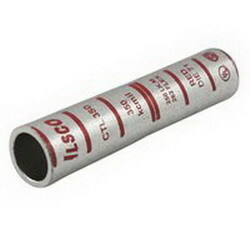 Detailed Description: Ilsco Compression sleeve in brown color is made of seamless copper for durability and high conductivity. It has electro tin-plated finish for corrosion resistance and is rated at 600 Volts. Measures 0.312 Inch inner diameter x 0.421 Inch outer diameter x 2.625 Inch and has die index number 1-33 with a strip length of 1.375. It has long chamfered barrel and can accommodate a conductor of size 2-6 AWG that can withstand a temperature of 90 deg C. Sleeve is UL listed, CSA certified and RoSH compliment.